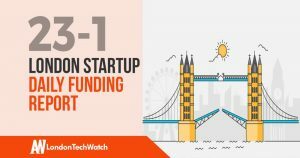 The latest venture capital, seed, and angel deals for London startups for 23/1/19 featuring funding details for Nutmeg, Growth Street, Growth Intelligence, and Giraffe360. You are seconds away from signing up for the hottest list in London Tech! Join the millions and keep up with the stories shaping entrepreneurship. Sign up today.